Most people who suffer from back pain are employees who spend their days seated. Using the standing desk reduces back pain because it also helps to improve your posture. With a chair, you can hunch over or slouch. But with a standing desk, you have to maintain an upright posture. Employees transitioning into standing desks, report of positive changes around two weeks in, while those who revert to sitting also report of negative changes in back pain in the same time period. Using a standing desk reduces the chance of getting heart disease or suffering from a heart attack. A study done involving bus drivers and their conductors showed that the former was twice as likely to suffer from heart disease as the latter. An intense one-hour workout would not be able to negate the effects of sitting all day. The standing desk, therefore, helps promote good health by averting heart disease. Using a standing desk helps to reduce the blood sugar levels. This is especially helpful after meals. Standing for three hours after a meal reduces the spike in blood sugar levels by about 43%. This further helps to reduce the risk of diabetes. This also goes hand in hand with its role helping to reduce risk of obesity. The best way to ensure weight loss is to exercise. However, studies have shown that you burn up to 30-60 more calories each hour standing compared to sitting. Alternating between standing and sitting at the office will, therefore, help to reduce risk of obesity and being overweight. 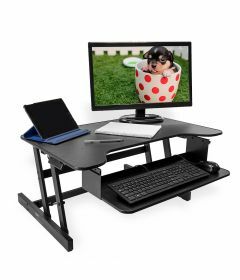 However, the standing desk only aids and does not work in isolation from exercise and proper diet. 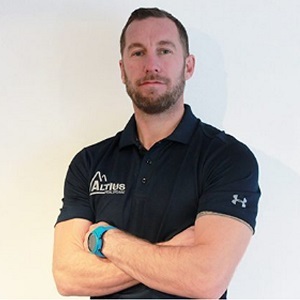 Expert Doug Jones gave us his insight into the "The Impact Of Sitting" The blog contains lots of great tips and techniques to improve your sitting aswell as advice on burning calories! 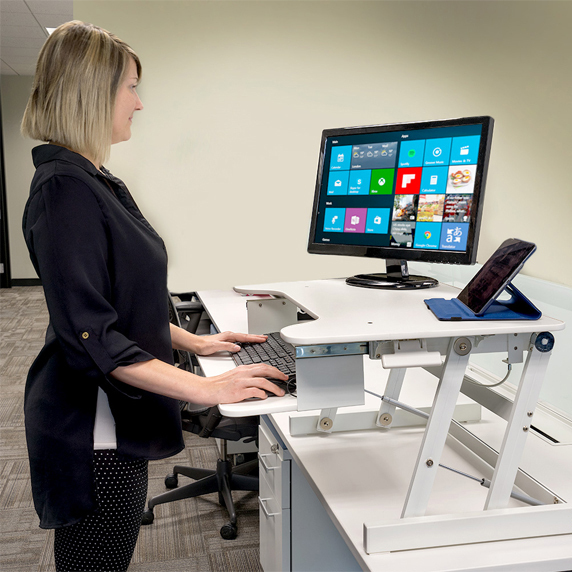 The standing desk helps to improve worker’s productiveness. 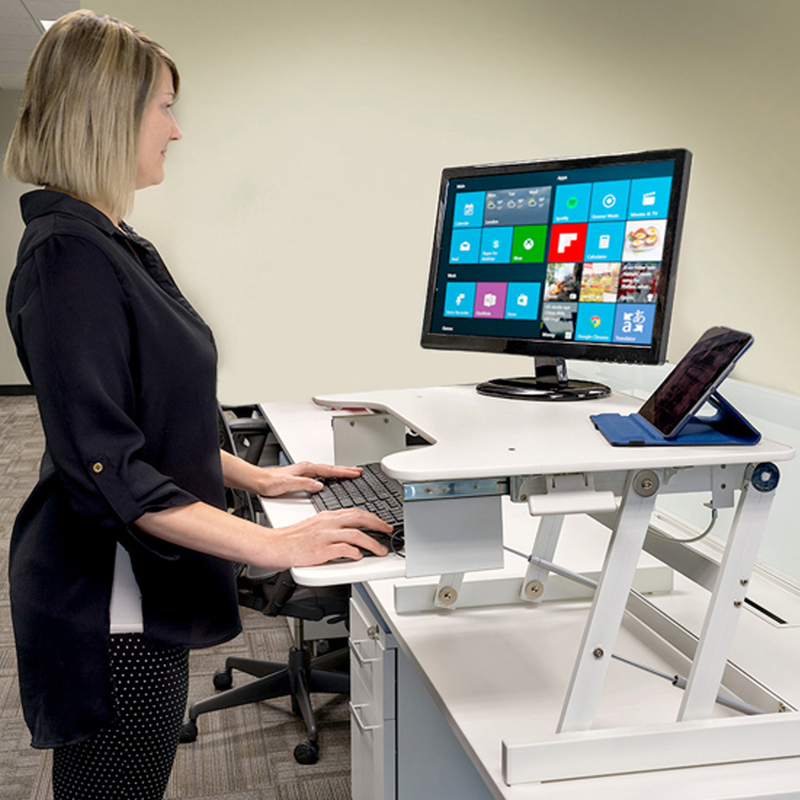 While most employers worry that standing up could affect some activities such as typing, studies have shown that using a standing desk will not reduce your typing speed. In fact, because standing desks improve your mood, it is more likely that productiveness will increase. 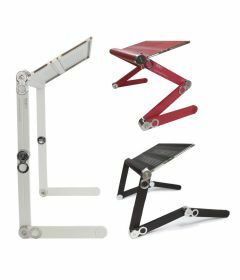 Standing desks are worth investing in as a part of your office furniture. 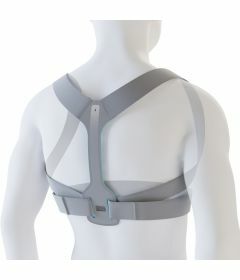 They will boost your performance as well as the overall energy levels of the work place. 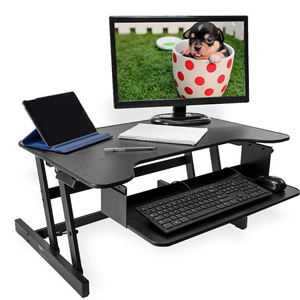 People who use these desks say that it improves their mood and helps to alleviate tension and reduce stress. This is beneficial not only for the office but for your life in general. 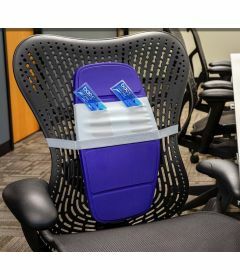 Here at BackPainHelp, we have a range of products with the workplace in mind. Checkout our post on Wellness Within The Workplace it’s worth checking out!